Keep your dog safe and comfortable! This strong wire dog muzzle of large size will perfectly prevent dog biting and chewing. South African Boerboel mastiff breed is originally bred to prey on lions. It is an extremely strong dog of huge power and size. 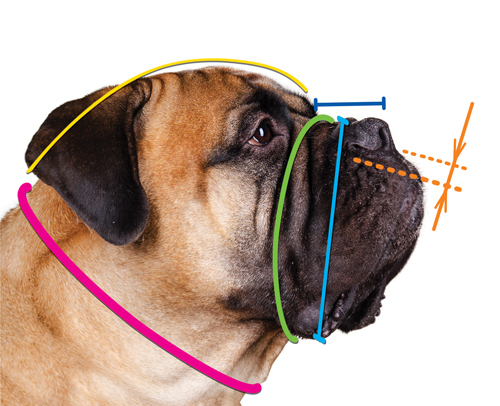 In daily life of a Boerboel breeder it may often occur a situation when he is required to have his dog muzzled. Of course it is a necessary means in public and at veterinarian. As a responsible and caring dog owner, you probably wish to choose the best dog muzzle for your pet. 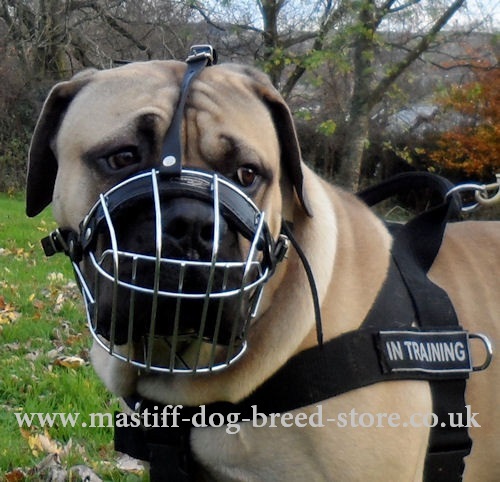 We propose a strong and comfortable dog basket muzzle for South African Boerboel protection. 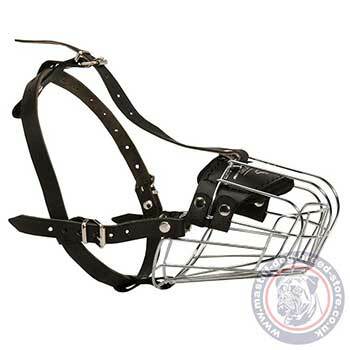 Wire dog muzzle is made of smooth, rustproof metal basket. It provides perfect ventilation and a dog breathes free. The shape of dog basket muzzle allows dog pant, lick nose and even drink water muzzled. Our designers care of comfort of your dog. A wire basket dog muzzle is padded with felt in the uppe area to prevent rubbing of dog skin where it touches dog snout the closest. 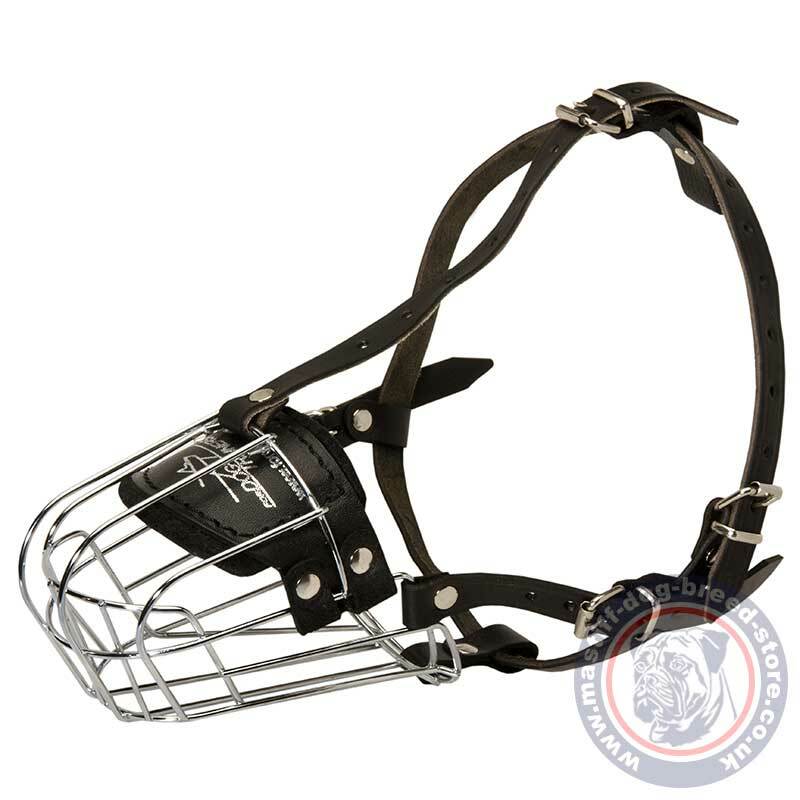 This wire dog muzzle is a perfect choice if you are just starting to use a dog muzzle. It is securely fixed on dog's head with reliable leather straps. Your dog will not be able to take it off. Train your dog to wear a muzzle step by step and you will have no problems with it.